(CNN) -- The men's U.S. Open final between Rafael Nadal and Novak Djokovic will be played on Monday after officials made the decision to call off the match due to persistent rain in New York on Sunday. 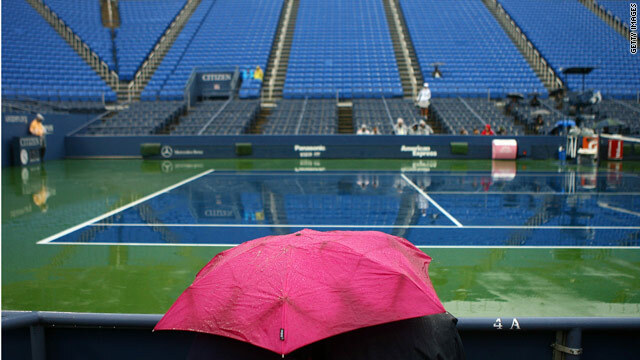 The final was due to start at 4.30pm local time but U.S. Open officials took the decision to postpone the match at 6.20pm, with the rain at Flushing Meadows showing no sign of stopping. "Due to the continued uncertainty of the weather forecast and to be fair to the players and not inconvenience our on-site fans any longer, we regrettably have to move the US Open Men's Singles Final, " a statement on the official U.S. Open website read. It will be the third year in a row that the final grand slam of the year has ran into an extra day because of bad weather, re igniting debate over whether a roof should be built over the Arthur Ashe court like those in use at the Australian Open and Wimbledon. The women's doubles champions will also be decided on Monday, with Lizel Huber and Nadia Petrova leading Vania King and Yaroslavl Shvedova 5-4 in the final set. The doubles match is scheduled for 3pm local time, with the men's final to follow not before 4pm. For world number one Nadal it will be his first U.S. Open final, having already won the other three grand slam tournaments. Should he win the Spaniard would not only achieve the career grand slam but would become the first man since Australia's Rod Laver in 1969 to win the French, Wimbledon and U.S. slams back to back. Meanwhile, third-ranked Djokovic will be contesting the New York final for the second time in his career after beating six-time champion Roger Federer in a five-set semifinal on Saturday. Informed that rain was forecast for Sunday by reporters in his press conference, the Serbian was relieved that he might be given some extra rest time after his exertions over Federer. "I will have to do a lot of recovery, because it's been exhausting match. I have to be ready in less than 20 hours," he told the U.S. Open website. "I don't know the rituals of how to invite the rain, but an extra day would be great, actually."